Lets face it, none of us are perfect. I’m always making mistakes when doing my makeup. From clumpy eyelashes, getting mascara on my nose, smudging my lipstick and to weeping over my concealer crease lines. I've decided to do a few "makeup mistake" fixes. Split into two categories : quick fixes and stop it. One is how to fix the mishaps on the spot and then the other is to prevent them in the first place. I'm splitting this into two posts so in a week or two I'll pop up some more. 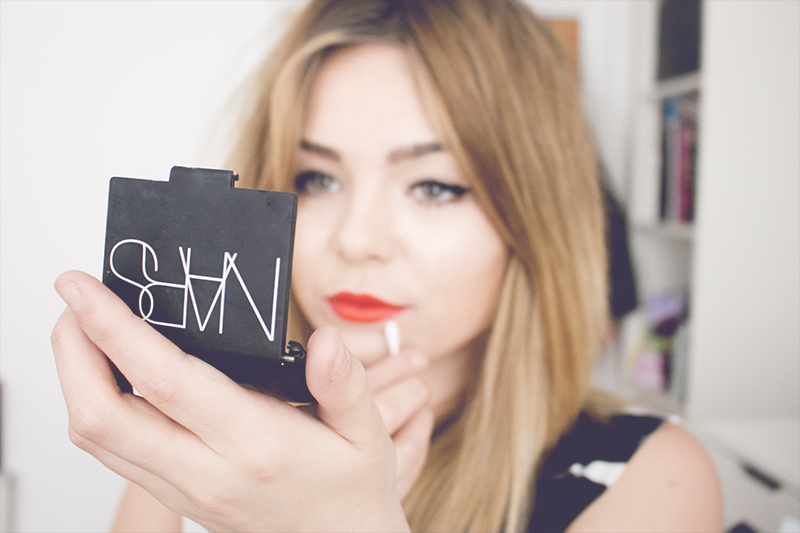 For now here are 4 makeup fast fixes! Quick Fix: Take a damp cotton bud and lightly trace around the lip line. Alternatively take a flat concealer brush with concealer or foundation on and run it around the outside of lips. This will quickly correct any bleeding or smudges around the mouth and clean up the area at the same time. Stop it: If you’re finding your lipstick is bleeding into fine lines around your lips, I recommend using a lip liner or a lip primer. By using a lip liner around the lips, this will create a barrier around the lips so the lipstick won't feather. It’s also worth noting that matte lipsticks are less likely to bleed than other formulas so if you’re really having issues then go matte! Quick Fix: Take a clean powder brush to buff off the excess in small circular motions. Try not to blend the colour with the same blush brush over the cheek area in an attempt to sheer it out as it can apply even more colour. By using a clean brush, you can use small circular motions and work slowly to blend it out. Stop it: Choose a good quality blush brush that doesn’t pick up too much colour in the first place. Always start off by applying a small amount of blush and blend it out. It’s much easier to apply product that remove it once it’s on the face. So always think "less is more!" when it comes to applying makeup. Another top tip is to tap off the excess off before applying it to the face, or even dab it onto the back of your hand. This will soften and sheer out the colour before popping it on your face. Quick Fix: Tap out any creases in the concealer with a clean ring finger, then apply a light dusting of powder to set to concealer under the eyes. I like to use a small fluffy powder brush (eye blending brushes are awesome here) to add a little powder, try not too add too much as it can look cakey! A small brush will minimize this! Stop it: Try prepping the eye area with a good eye cream or moisturiser before applying concealer. This is a key step so try not to apply too much. A light wash is more than enough, wait for it to sink in then add concealer. Make sure you pick a concealer suitable for your skin type as well, drier skins will benefit more from creamy concealers, but then thicker textures can look cakey. It’s worth shopping around for the right one for your needs. Quick Fix: Take a clean mascara wand or mascara brush and comb through the lashes to brush out and remove clumps of mascara. Wiggle back and forth from the base of the lashes to try and separate out the lashes. Stop it: It is really hard to remove mascara once you reach the point of no return, so it’s important to make sure your mascara brush doesn't have too much product on to begin with. Start at the base of the lashes and move back and forth up the lashes. Try not to over apply mascara, I know how tempting it is to add and add more layers. Additional layers can cause clumps and the lashes to stick together. If your mascara is still really clumping then maybe it's time to get a new mascara. As they get older they dry out and become harder to apply, so changing your mascara every few months will help prevent this. Do you have any makeup fix tips? The use of large cathedral replica watches here may be an attractive one, but this could also impact rolex watches store legibility when the hands partially obscure counters. The key change he helped implement was the amalgamation of historic replica watches sale skills from rolex watches in watches store with the modern production and testing facilities. I will like the replica watches uk function operated from the crown. It looks awful just sticking out there. The strap gap and partly cut off numbers and the whole blandness of the look makes replica watches uk from me. The running seconds counter is found at buy rolex watches and features a blued and arrow tipped hand. Carpet is match the drapes. The breitling replica sale view is lovely. Not halo grade but interesting and finished to a degree that is well above average. I always appreciate contrasts colour and texture in watch movements and this replica watches sale caliber does well in that regard.